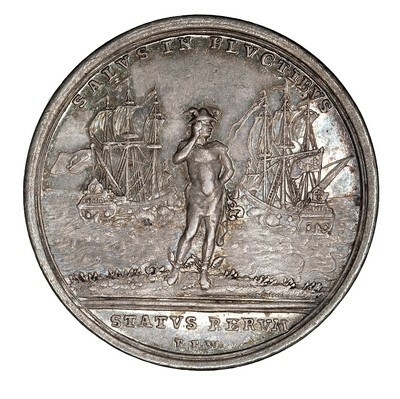 Obverse: SALVS IN FLVCTIBVS; in ex., STATVS RERVM (="Safety at Sea, the state of affairs") - Mercury standing facing, upon the shore, listening, with right hand at his ear; behind him, at sea, two frigates bearing upon their ensigns, respectively, the harp of Ireland and the lilies of France, engaged in firing broadsides at each other. Reverse: SED MOTOS PRAESTAT COMPONERE FLVCTVS (Vergil, Aen. 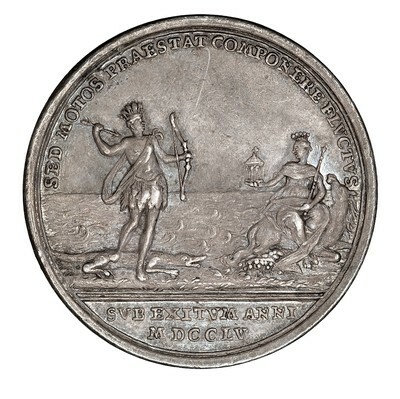 I, 135, 7, "But first, it is better to calm the turbulent seas" or "But he has power to soothe the troubled waves"); in exergue: SVB EXITVM ANNI/ MDCCLV ("=at the close of the year 1755") - On l., Indian warrior standing r., with crown and girdle of feathers, bearing in l. hand a bow and in r. an arrow, his r. foot upon an alligator; at r., female std. upon a sea-horse, bearing in r. hand a Temple of Fame and in l. a scepter; at her feet, cornucopia; in background, ocean. Series: "The War at Sea and among the Western Islands"
Note: A "Franco-American jeton," 224.2gns. G. M. Parsons in AJN, XXI, 7, considers the female figure to typify Britannia, and the Indian and alligator to allude to the American colonies of France. "There was safety at sea," which was ruled by Britain, but the Indian (France) "was ready to adjust the arrow to the bow." 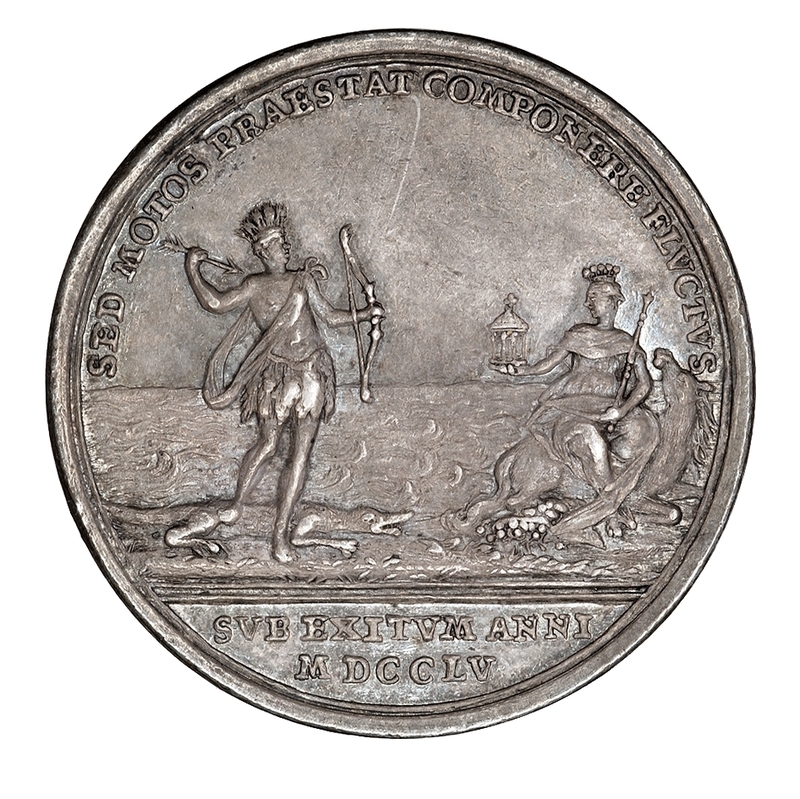 He considers the medal "an invocation for peace, in the threatening state of affairs between the two nations."